Product #60594 | SKU MMEDGE | 0.0 (no ratings yet) Thanks for your rating! The Matrox Monarch EDGE is a 4K/multi-HD, low-latency encoder for webcasting and remote integration (REMI) applications. A powerful H.264 encoder that can flourish in any workflow, Matrox Monarch EDGE is capable of delivering resolutions up to 3840x2160p60 or quad 1920x1080p60 for 4:2:2 10-bit, broadcast-quality video. 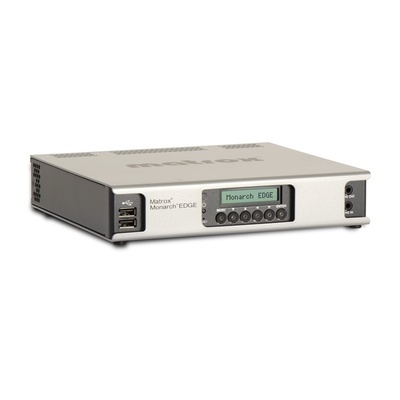 This new encoder also offers flexible, future-proofed 3G/12G-SDI and SMPTE ST 2110 over 25 GbE connectivity, plus versatile multi-protocol support including RTMP, SRT, MPEG-2, and RTSP. Video professionals, system integrators, and broadcasting organizations are now equipped to easily address demanding requirements in new, emerging, and existing webcasting, REMI, and high-density contribution workflows.